There is something more on VegaDice ! From now you will be able to choose the currency you want to bet so you can play with alt ! There is the available coins : Bitcoin, Dogecoin, Ethereum and Litecoin ! Have fun and try your luck now on VegaDice ! Three news in one ! A lots of good news. 2) Do you know Ripple? It is listed on allcoins ! Go grab some XRP on the Ripple Faucet. We want to try another little game for you. More info on the page : Puzzle Bitcoin Seed Game. You can eventually share this puzzle with your friends or on some forums to get some help ! Please update your Mining Software ASAP or you won't be able to mine anymore. Monero will change his mining algorythm so without the last update, you won't be able to submit your hashes. You can find the new Mining Software here. As you requested through the poll, we added the most voted coin on your favorite faucet: Stellar Lumens (XLM) is added on allcoins.pw! As always, the fastest way to earn : make some offer from the offerwalls, exchange your rewards from BTC to XLM and make your withdrawal ! 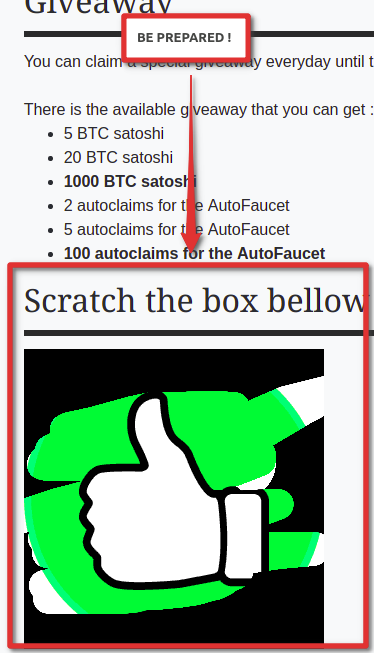 For the nexts days, you will be able to claim some Litecoin Cash on the Litecoin Cash Faucet ! This event is supported by litecoinca.sh, go to their website to make a wallet. We have released a new game called VegaDice and it involves rolling the dice and see if you win! It is a provably fair game with interchangeable odds and bets. You can set up the AutoBet in a multiple ways to bet for you and react differently on a win or on a lose... Or after a number of rolls ! Give a try : Play to the VegaDice and check your instant stats to see if you are in profit or in loss easily ! We are doing a giveaway event during 10 DAYS so you can receive up to 10000 satoshi easily ! BE AWARE : the giveaway page will be accessible only during the 10 days event, therefore from 12/23 to 01/01 (included) date of the server (type /server datetime on chat)! You have some time to get ready and invite some good friends to claims their daily giveaway or at least, warn them about this event ! You will be able to claim one of these prizes daily by scratching the a black box on the giveaway page which will show your prize! And the best part is it is free! Happy celebrations and Happy Claiming! More earnings on OfferWall ! We also made some updates on the levels for the OfferWall. From now, all offerwalls rewards will be paid faster than before; we have lowered all delays and the level required to get instant payment are lowered too ! You can see the new levels step for the offerwall on this page : my level. Enjoy it and keep making offers no matter the level you are... Levels are raising so fast : 50 XP are added with every offers made ! Go to the OfferWall and get some bitcoin ! As you probably know, you can mine some coins from here, with our Cmd Miner; which is giving the best rate in the world, probably. Today, we introducing the first Command Line Crypto Miner Contest. Starting next monday, the top 3 users who collect the most hashes mining with our Command Line Crypto Miner each day will win (Daily prizes tipped in chat). At the end of the week, we will tally all the hashes for each user and the three users with the most hashes will win a whopping (Weekly prizes)! Make sure to invite your friends to join in too! The more participants, the higher the prizes!! Don't forget, even if you don't win a top prize, everyone wins because all hashes will still be paid out like they usually are! In order to participate : you need to download the Command Miner and let it run (no configuration needed)! During the contest make sure to check who is in the lead by typing in our chat : "/pool day" for the days current leaders, and "/pool week" for the users who are in the lead for the weekly prize. You can also check your rank on the miner page. After this week's contest, prizes will be given randomly on a daily, weekly, and monthly basis throughout the year.